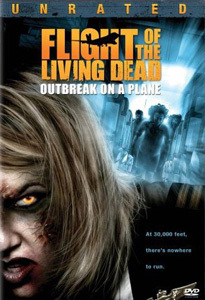 A mad scientist is transporting a body on a flight from LA to Paris when they hit a storm and the corpse gets loose, returns to life and starts to eat people. This is mindless zombie mayhem as a host of disaster movie cliches battle for survival without much success. There's plenty of gore and the director squeezes the most out of a low budget with some nicely handled special effects and some great looking zombies. This is action packed stuff that doesn't take itself seriously and it's a lot of fun for zombie fans.